There must be something in the air, because before I left the house to head down to the office today, I put on my running shorts and sneakers so that I could be ready at a moment’s notice to break into a dash. What’s in the air, you ask? Tomorrow is the annual Camp Highlands track meet which dates back to the early 1900s when Doc Monilaw was the camp director. The first event actually starts today with the cross-country race – a one-mile course around camp. Each entrant gets a point for his team, no matter what he places. Tomorrow the boys will compete Army versus Navy in several track events including the high jump, the long jump, 50 or 70 yard dash and shot-put. It all culminates in the giant action-packed relay. In the afternoon, they’ll have a choice in clubs and a picnic supper on the hill. Finally boys will participate in the world-famous Games on the Hill complete with the broom relay, tennis ball/parachute game (what is that called anyhow? Leave a comment if you know), egg toss and a pie eating contest (among other things). Happily everyone is in camp for the festivities! Cabins 10, 11 and 12 just got back from their hiking trips in the Porkies. Cabin 11 saw two bears! How cool is that? Many of our seniors will leave for their big trips next week. The remaining Junior cabins will go to the Porkies for their hiking trip and the Colts’ canoe trips are next week as well. We just posted a good smattering of photos on the gallery. Take a look! And now for that run. i ❤ CH // tracy b.
It’s warming up nicely, and it sounds like we’re going to be lolling about in true summer temps by the end of the day. Wednesday at camp is Division Day (a.k.a. cook’s night off!) where the boys band together by division for activities and then a cookout. Cubbies will hike around the back bay of Plum, through one of the oldest old-growth hemlock forests in Wisconsin to Star Lake for their overnight. 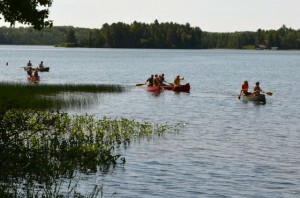 They’ll swim in the sandy lake, roast marshmallows, sleep in a tent and have a generally awesome time. Colts are headed into town for an awesome day at The Waters hotel where they have some great water sides. They’ll wrap up their day with a cookout supper and watching the ski show in Minocqua afterwards. 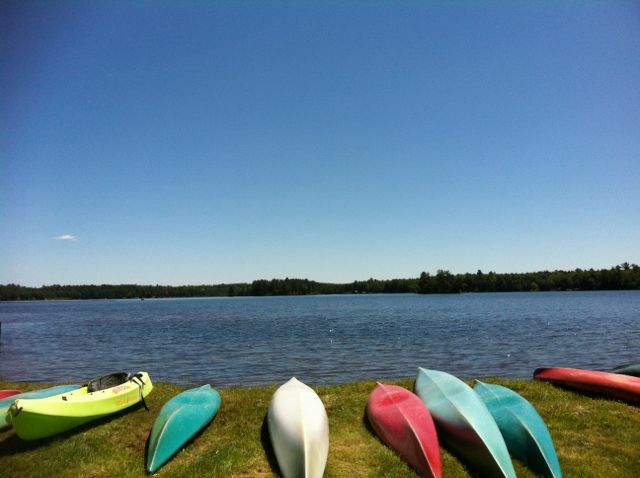 Most of the Junior division is out on their hiking trip the the Porcupine Mountains and the others (cabins 8, 9, 13) will be in camp having “Worthwhile fun” (direct quote from Andy Bachmann) and the Seniors are off to Red Pine Camp for Girls for their annual social. What I’d give to be a fly on the wall! There are new photos on the gallery. I’ve been trying to decide the best way to order them. I think I’ve finally decided they’ll be newest to oldest. Sorry to be such a flip-flopper. This afternoon is kind of heavenly for team Bachmann. We will enjoy the first moments of quiet we’ve had in *weeks*. Not that we’re complaining. Trust me, nothing makes me happier than the sound of 50 Cubs and Colts at evening dip, but there is also something magical about the sound of the wind off the lake and not much more! I can’t remember a more beautiful start to camp. It makes for a great day of activities. Water sports this morning had a nearly still lake, and this afternoon the breeze picked up and the guys were flying across the lake on the Sunfish. The guys at land sports were loving the sun and the cool breeze. All this great weather makes for lots of running around and the building up of a mean appetite. Did you know that Sharon Bachmann does all the meal planning at camp? With her planning and Lois’ incredible cooking, we never go hungry here at Camp! A good majority of our meals are made from scratch, a very unique thing in the camping world. No frozen pizza for us! Tonight is taco night. Let’s just say that taco night is more than a meal at Highlands. It’s a multi-media experience. Complete with costumes and oftentimes, music. You are just as likely to see a horse mask as you are a rainbow colored wig. It’s kind of crazy. My personal favorite is the dessert tonight, though. It’s ice-cream with a corn-flake and brown sugar topping. It’s almost embarrassing how much I love this stuff. 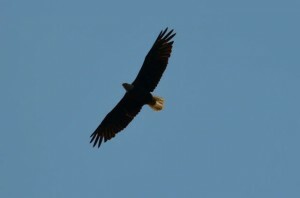 Look who was flying overhead! Are you looking to subscribe to the blog? You can do it by clicking on the RSS feed button in your browser URL field. Also, remember, there a lots of new photos on the gallery and there will be gobs more tomorrow. Mike Bachmann has been out all afternoon snapping pictures of the guys at their activities. What's a first night at camp made of? Boys playing soccer while waiting for the bus. A little bit of jittery, nervous excitement. Old friends. New friends. Roasting marshmallows around a campfire on a starry, cool evening. Hearing Taps play for the first time of the summer (or the first time ever!). That’s what a first night at Highlands is made of. The fog was heavy this morning. Beautiful. Last night after a filling dinner of homemade spaghetti the boys learned a little bit about a “day in the life” at Highlands during the evening campfires. Taps did blow, and after a long trip in the car or on the bus, the guys were asleep. It was a cool night, but today warmed up nicely. The weather could not be more beautiful! Boys rotated through stations learning about key points around camp: the kitchen and dining room, the rifle range, the waterfront and to a common area to learn about activities. Tonight the guys will have chicken noodle soup and sub sandwiches with watermelon for dessert. If you need information about setting up Bunk Notes or Replies, you can download the informational form on the homepage. It’s a great system. Remember, if you want your boys to email you back, you must attach a Bunk Reply. This weather could not be more perfect! A view from the boating bay. The summer is off to a great start. The guys are in the camp store (as I write this) getting their fill of water bottles, pens, stamps and toothpaste! It’s just business as usual here at Highlands. I’m so glad they are all here! After a beautiful afternoon of (not-so-patient) expectation, all the boys are here! For the kids and families who were here at lunch, a siesta-inducing lunch of turkey dinner was served in the dining hall. The staff and campers who were not on the bus joined in the track to cheer the busses’ arrival. Lots of smile and hugs and hi-fives went around as gear, trunks and back packs were quickly distributed to cabins. The boys are off now to supper (spaghetti!) and will head back to their divisions for camp fires and a general overview about what happens in a day at Camp Highlands. Moms and dads, we know you will miss your guys while they are here. We are so honored to have them with us. We look forward to teaching, inspiring and revealing their hidden talents here at Highlands. Here are some things you’ll want to know about Sunday 6/24. •Please have your son at the O’Hare Oasis by 9:15 a.m. so that we can be on time for our 10 a.m. departure. • Our Rockford stop is between 11:00 and 11:30 am at the Clock Tower at Business 20/State Street. • We stop in Madison, WI at the Pine Cone Shell, Exit 132, 51 Madison/Deforest between 12:30 and1:00 p.m.
• The best time to arrive is 1:00 – 3:00 p.m on June 24. • If you are staying in the area and need to drive back home, you may bring your son earlier that day. Directions from Minocqua: US 51 North to County M. Right on M until you reach N. Right on N 4.5 miles to The Corner Store. (Great ice cream cones!) Turn left at the store on Razorback Road, then right on Camp Highlands Road; the road dead-ends at Camp. It’s about 5 miles from The Corner Store to Camp. Directions from Eagle River: Hwy 70 west to St. Germain. Go straight on 155 at the intersection with the giant statue of Chief St. Germain. Go through Sayner to County N. Left on N to The Corner Store. Turn right on Razorback Road, then right on Camp Highlands Road; the road dead-ends at Camp. It’s about 5 miles from The Corner Store to Camp. We will call you once your boy has landed and is in our care. We will then get him to the busses to be transported to camp. All boys will be in camp and ready to eat supper by 6 p.m.! We can’t wait! We fully expect this to be….the best summer ever! From Andy and Mike Bachmann…. We are happy that your son is going to be with us at Camp Highlands this summer. This letter contains information you will want to save. Please don’t hesitate to give us a call with any questions. MAIL: Please write your son frequently. He will check the mail every day! The summer address is: CAMP HIGHLANDS, 8450 Camp Highlands Road, Sayner, WI 54560. E-MAIL: We utilize the services of Bunk1 for e-mails. They coordinate the notes so we receive them in an organized manner. You can download the Bunk1 information on the homepage. We even have the instructions in Spanish! There is a link on the homepage called “email your camper.” Once you’ve set up your Bunk1 account, this is the link you can click to access the Bunk1 portal. Also, if you need to contact us you can always call, but we also answer email. Our e-mail addresses are: Mike: mike@camphighlands.com, Andy: andy@camphighlands.com, Tracy: tracy@camphighlands.com, Sharon: sharon@camphighlands.com. PACKAGES: We encourage packages, but we ask that you NOT send food – even the healthy stuff. Packages are opened in the office, and edibles will have to be confiscated (and will not be saved until the end of camp). The four-legged critters can clean out a cabin in no time. Books, magazines, games, and puzzles are always popular. PRIORITY MAIL, UPS, DHL, and FED EX deliver right to camp. They also pick up at camp if you wish to ship baggage home. TELEPHONE: The camp office telephone number is 715-542-3443. The best time to reach us is between 9:00 and 12:00 in the morning. The answering machine is always on, and we promise to get back to you if we are out when you call. We do not allow the campers to receive or make phone calls. It is a real interruption of life at camp. It also has a way of bringing on homesickness! Please don’t send cell phones, unless you want one for your son’s travel (remember to include the charger). We will keep the phone in the office until it is time for him to go home. THE CAMP HIGHLANDS LODGE: If you plan to come to gather your son at the close of his session, or visit camp during the summer, you will want to know about our Highlands Lodge. It features seven guest cottages and a separate dining facility. 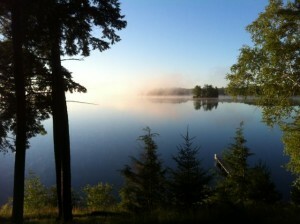 The Lodge cabins all focus on the lake and maintain their rustic northwoods charm. This is a convenient and fun way to visit camp! To make your reservation, email Sharon or call her at 715-542-2950. FRIENDS AND FAMILY CAMP: August 11 to 18, we offer a fun vacation where the parents get to play too! Each family has an individual cabin. The meals are great, and it is a lot of fun. Information can be found from the Friends & Family link on the web site home page. Contact Sharon to enroll. CONCERNS: Please know that ANY TIME you have a concern about your son; we want you to call or email us. You may read something “between the lines” in a letter and worry about it for a week before calling. Nine times out of ten it is something we can check on and clear up immediately – giving you a better night’s sleep! We do not consider your calls to us a bother. They are one way you can assist us in helping your son have the best possible time at camp. 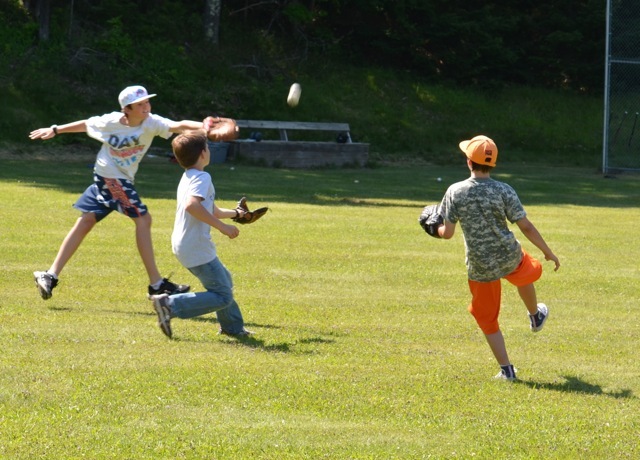 A TIME TO GROW: At Camp Highlands, character and values are important. Your son will learn new skills and make new friends. We will do our best to help him have a relaxed and fun time. We emphasize the value of each person. We provide different chores to foster responsibility. We encourage boys to try new challenges and finish what they start. Kindness and consideration are a big part of everyday life at camp. We will do what we can in our own unique setting to reinforce those qualities we know you believe to be important. We will have a wonderful time with your son! Thanks for sharing him with us! Just a few words to you from a Highlands mom who has been around for a while. As camp time nears, I know that your and your son’s thoughts will be turning to Camp Highlands. We are so glad that he will be with us this summer. I have been re-reading the comments from the parent response forms that we sent out at the end of last summer. Those comments help us know that we are on the right track. Your son will learn much while he is here– learning to take responsibility – learning to put his energy to the good. — and learning what it means to be a worthwhile man. Mike and I have been in your shoes. 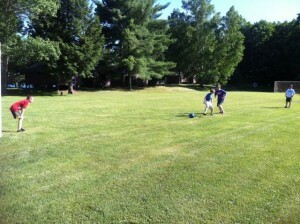 It was a little easier to send our sons Tim and Andy to camp. They were at Highlands and we had selected and knew all of the staff. But when we took our daughter Laura to her camp — that was another story! Her first year, as we reached the gates of her new camp she started sobbing. That did it for me. I was a wreck for the first week she was there. I’m a worrier, how about you? I am writing to assure you that your son will be in good hands! We have an absolutely wonderful staff! We can assure you of that, because we know them. Our staff is an amazing blend of teachers and college students. Our main criterion in staffing is selecting “nice people”. Your son will have a ball! We care about your son, and will do all that we can to help him have a great time. Andy, Tracy, Mike and I think about the boys as our own while they are at camp. Please know that we stay on top of any “homesick” situation, and help boys work through any adjustment problems. There are surprisingly few. A friend here in Western Springs was telling me how nervous she was because her daughter is going away to camp for the first time. I told her what I want to tell you: Don’t hesitate to call if you have a concern about your child. We are in and out of the office every day, so chances are good that you will reach a Bachmann when you call. We also check the answering machine throughout the day. One of us will follow up on any question or concern, and get back to you with an up-to-the minute report. The office number is 715-542-3443. Thank you for the confidence you show in all of us on the Highlands staff. We are looking forward to a terrific summer with your son! PS: A big thank you to moms that have given us names of new campers. Your help is so appreciated!! • Feel free to call or email me any time. Do not hesitate to ask for an update on your camper – I’m happy to make inquiries and give you a report. I am in the office all morning long, and much of the afternoon. If we are not at the phone, leave a message and we will call you back shortly. • We make frequent blog posts all week long reporting on the weather, fun stuff going on at Camp, what the boys are eating for lunch and MORE. It’s a great way to feel connected to your camper, as well as a great way to relive the memories once he’s home from Camp. • Sign in to the gallery on the website. We upload photos several times a week. We try our best to get as many faces as possible on there! • If you’d like to email your son, please use our two-way email system through Bunk1. Just click on the “send an email” link on the home page of camphighlands.com. I can usually answer questions you have about this system, and their customer service is great. • Like us on Facebook! We will be making daily posts there. Tell your friends and family! It’s a great way for them to stay connected with your camper, too! We so appreciate your son’s attendance at Camp Highlands. We try our best to keep you informed about what’s going on at Camp. If you have ideas about things you’d like us to report on, just let me know! I love hearing from parents, and am always available for a chat. If you have any concerns at all just give me a ring.